We have been under way for 27 days and are making the adjustment to living aboard and traveling. There was finally time and Internet availability to research how to create a blog site, and I apologize for this somewhat lengthy initial entry to get our journey up to date. It is starting to sink in that this is not an extended vacation and will be a new way of life for now. There is balance of work and pleasure most days, although the typical day consists of more work than you might imagine. Keeping the boat running, safe, reasonably tidy, and meeting the needs of all on board, including our two 4-legged crew, takes a good chunk of the day. On board and away from port we have to be pretty much self-sufficient. 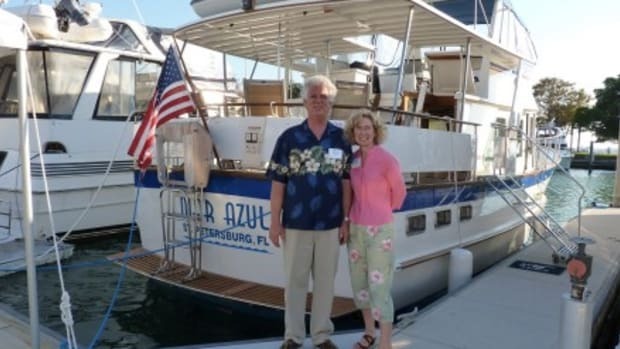 So between the two of us we cover the jobs of captain, cook, mechanic, deck hand, meteorologist, cruise director, boat cleaner, navigator, dog walker and any other job that might arise. If something breaks, we have to be able to fix it ourselves or risk being stranded or inconvenienced. We split up the duties based on our skill sets and interests and some tasks are best accomplished as a team. Bob has great mechanical, computer and electronics problem solving skills, and expertise with weather forecasting and navigation from his pilot career, which make him an invaluable captain. Mar Azul (middle with a blue bimini) at the Longboat Key anchorage. Travel days so far have varied from an hour hop to the next destination, to a 20-hour overnight run. Some days we don’t travel at all, which gives us time to do chores and to explore and enjoy a particular location. While we prefer to travel during the day, sometimes it makes more sense to go at night. It is usually best to arrive at the next harbor in daylight, and keeping the boat off of sandbars, rocks and coral heads is the number one priority. Even with good charts and navigation systems, sunny conditions make arrivals to a new harbor much safer, especially in these waters. Sometimes there aren’t suitable places to stop to break up a trip, or weather or other reasons might dictate an expedited travel time frame. When we traveled from Ft. Myers Beach to Marathon we left around 6 pm, spent the night motoring in the Florida Bay, and came in to Boot Key Harbor the next afternoon. We are targeting an August 1 or earlier arrival in Fajardo, Puerto Rico before the active part of the hurricane season, to meet the requirements of our insurance contract. We need to average 11 miles per day to get to Fajardo by August 1. Currently we are averaging 20 miles per day, and are over a third of the way there. I don’t have nearly as many metrics to follow in my new life, but average miles per day to Fajardo are one we like to keep tabs on. We are glad to be ahead of plan right now, since the price for a few extra days of relaxation in nice harbor could mean tolerating crummy weather on future passages. Once we leave the Bahamas we will have several long and possibly more challenging trips. We will spend time waiting for optimal weather windows for those passages. With the trade winds typically coming from the southeast, and southeast being our primary direction of travel right now, we will often be moving directly into the wind. That direction of travel is less comfortable than having the wind behind you and being pushed along by the wind and seas. So lighter winds and calmer seas, or a change in wind direction is the most desirable conditions. 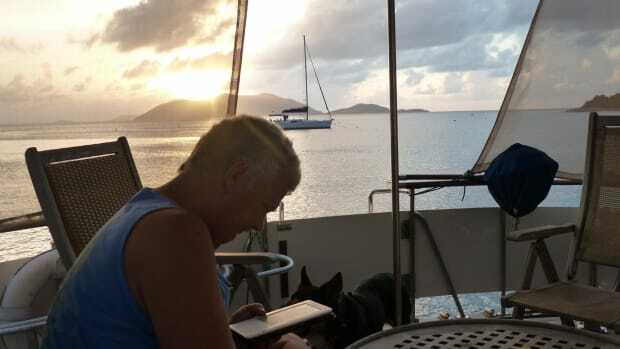 We try to stay on top of the weather forecast, which requires catching a marine forecast on the VHF or singlesideband radio on days when we don’t have Internet access. Lady watching for pirates & Bandit snoozing under way. Deciding what to do about boat insurance while cruising in the hurricane belt was a consideration we debated. Some people avoid cruising in the Caribbean at all, some go back to northern latitudes in the summer and fall, and some choose to go uninsured. None of those options were good for us, and we found an insurance company that let us develop an individual hurricane plan for our trip. Bob researched and negotiated a proposal that was accepted. Our primary plan for this year is to contract with a marina in Fajardo that will haul out our boat if a named storm approaches the area. We will stay within 24 sailing hours of that area during the hurricane season and will return to port if the weather deteriorates. That will give us about 5 months with plenty of great cruising grounds to explore including the Spanish, US, and British Virgin Islands. Our secondary plan, should we be caught away from port for some reason, is to secure the boat in the most sheltered location we can find with 4 anchors, which we have aboard. Hopefully we won’t have to exercise either plan. 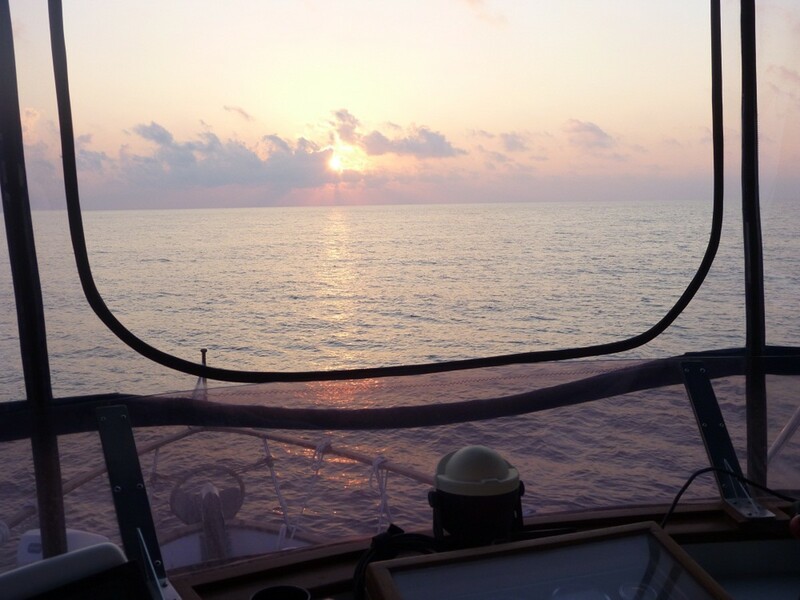 We are slowly making our way south, and over the last four weeks have traveled from the west coast of Florida to south Florida and the Keys, across the Gulf Stream to Bimini, then to Nassau and south through the Exuma Islands. 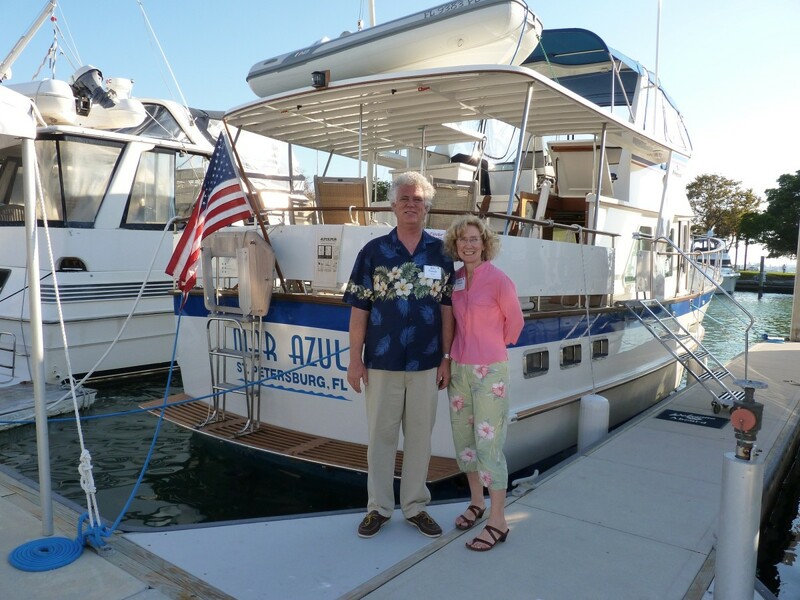 Longboat Key, FL – This was our favorite anchorage for weekend getaways while we were working. The island is dog friendly and well protected, although the small anchorage can be crowded. Longboat has wild peacocks on the north side of the island, and we have come across many of them on our dog walks in the morning and evening. Our friends Linda & Ted live a short dinghy ride away. Linda is a gourmet cook and wine guru, and whether she is hosting a meal at her house or recommending one of the terrific local restaurants, we are always treated to some wonderful food, wine & hospitality. When our old cranky dinghy motor wouldn’t start one night, Ted even rowed us back to our boat. Since Ted couldn’t come along on our travels, and we don’t row so well, we had to break down and purchase a new dinghy motor before we left. Pelican Bay, Cayo Costa, FL – A lovely, uninhabited spot on the West Florida coast, just south of the Boca Grande pass, and north of the famous Cabbage Key. A bit tricky to navigate with a boat of our draft, but we had some helpful local knowledge passed along by a liveboard sailor we met in the area a couple of years ago. There is a park ashore, and a great dog beach. Hurricane Charley devastated this area in 2004, although you would never know. The conditions were perfect for our April visit, however in the summer the no-see-ums can make a visit here uncomfortable. Sunrise crossing the Gulf Stream. 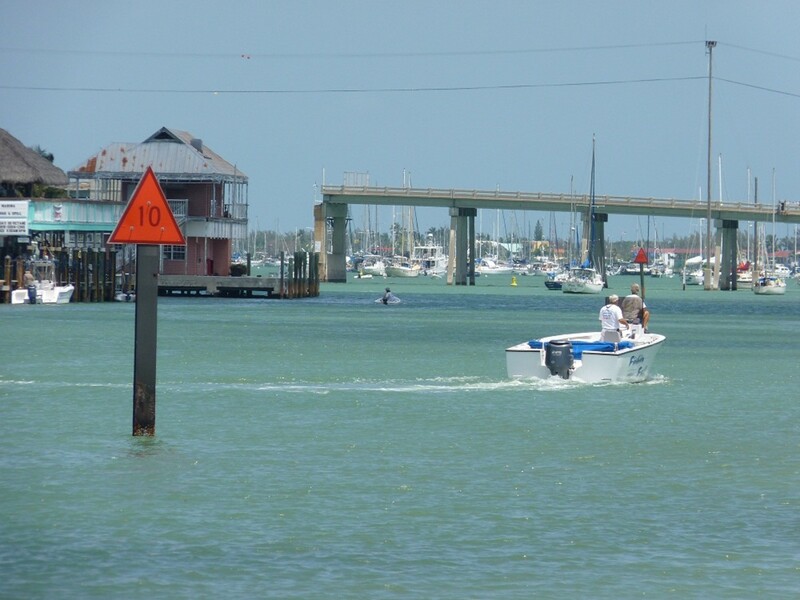 Ft. Myers Beach, FL – We like this location to meet up with our friends Steve & Jean. The shallow harbor is set up with a mooring field, and a strong current runs through the area. Every time we have been here we have gotten into trouble. Once we ran over the mooring ball and it got stuck under the boat. Bob had to swim down and dislodge the mooring while I powered the boat, which was a bit scary. This visit the lower part of the mooring line got wrapped around one of the stabilizer fins under the boat, despite our efforts to prevent that problem. We discovered the mooring didn’t have any chain, which would have been a better design given the shallow water depth and swift current. George, a fellow cruiser, saw us struggling and brought his dive gear over to help get us untangled. After that experience Bob updated his dive equipment to allow for short dives under the boat. If we get in trouble in some remote location we won’t be able to call a diver or SeaTow! Entrance to Boot Key Harbor. Boot Key Harbor, Marathon, FL – This is an interesting place that attracts many cruisers and liveaboards, especially in the winter season. 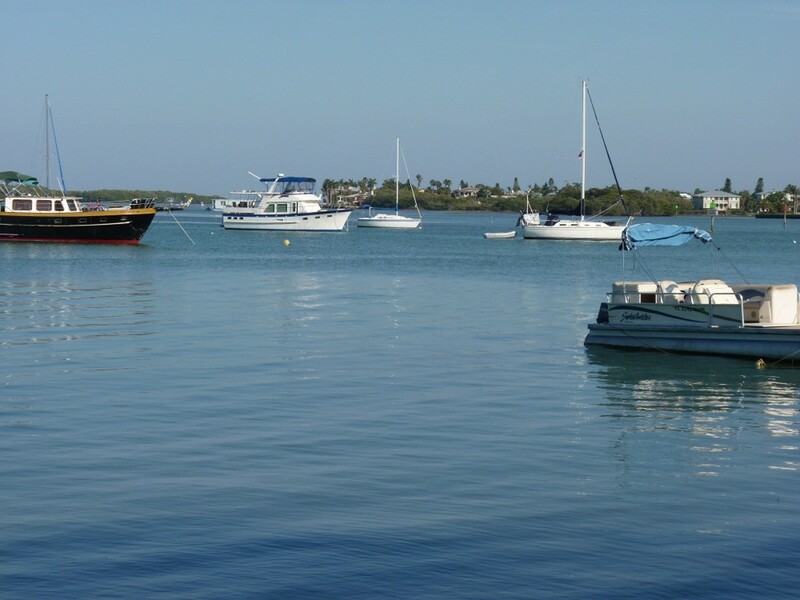 The harbor is sheltered, and the City runs a huge mooring field and land facilities including an expansive dinghy dock. There is a sense of community here, and every morning at 9 am they have a radio net that includes announcements, welcomes to new arrivals, social info, “for sale or trade” announcements, etc. A local bar and grill with a dinghy dock called Dockside serves simple food and beverages, has nightly entertainment and caters to the cruising crowd. There are shops within walking distance including a West Marine, Home Depot and Publix. Fortunately most shops are on the east side of US Highway 1. We had to cross the highway several times to get to the fish market and the dive shop. There is no footbridge over the road, and crossings can require a long wait or a long walk to the closest light. During our last visit here in 2009 a pedestrian was killed crossing the highway. Crossing US Highway 1 was our most dangerous passage thus far. Rodriguez Key, FL – Spent the night anchored at this little spot near Key Largo staging for our Gulf Stream crossing the next morning. From here it was about a 9-hour trip across the Gulf Stream to Bimini, so we made our start about 5:30 am. It was an easy exit into Hawk Channel and then into the Atlantic before sunrise. Winds were light and from the southeast, which was good. Winds from the north can create dangerous seas against the strong Gulf Steam current that runs south to north. We got a good pick-up from the current, and made almost 10 knots at times. For go-fast boaters, that’s a snail’s pace, but for us trawler boaters and sailors it’s like speeding. Flying the quarantine flag entering Bimini. Alice Town, Bimini, Bahamas – This was our port of entry into the Bahamas, and a charming, laid-back little town. We stayed at the Bimini Blue Water Resort marina, a modest facility with a hotel beachside and a phenomenal view of the shallow turquoise seas from the marina. Clearing customs was simple and fairly painless. We flew the yellow “quarantine” flag upon entry to the harbor, per protocol, and then filled out some forms. Bob handled the walk down the street to the customs and immigrations office solo, as ships captains are required to do. Crew get to stay aboard and relax while the ship is cleared – and that suits me just fine! We had no problems getting the dogs into the Bahamas, and had applied for their entry permits about a month ago. The local people here are very friendly and many stopped to say hello and chat without trying to sell us anything. They seemed very proud of their island and happy to have visitors. In reading the local paper, it sounds like the economic woes have hit them very hard, since tourism is their primary industry. As we have found in other island countries, trash & rubbish littered the streets and that made it a little less picturesque. 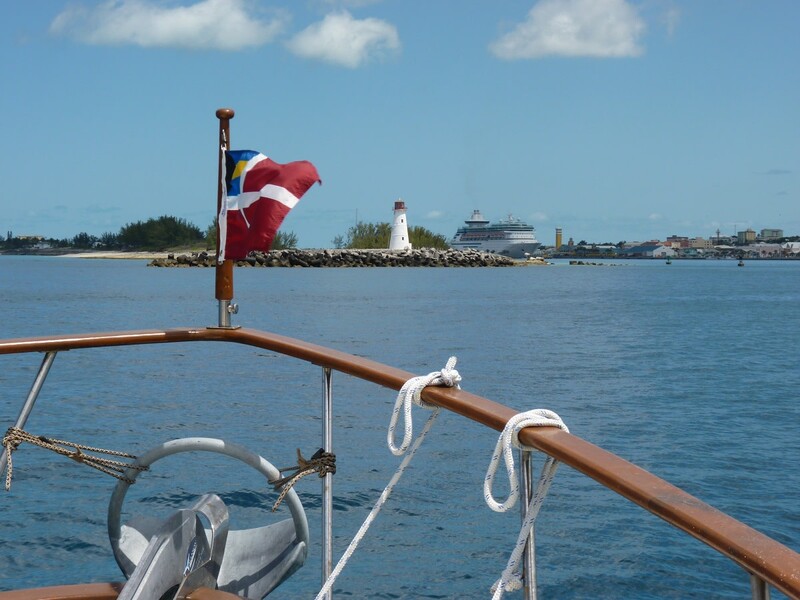 We met some fellow cruisers headed our way, and most had been to the Bahamas before, so it was nice to get some travel pointers for the upcoming passages. 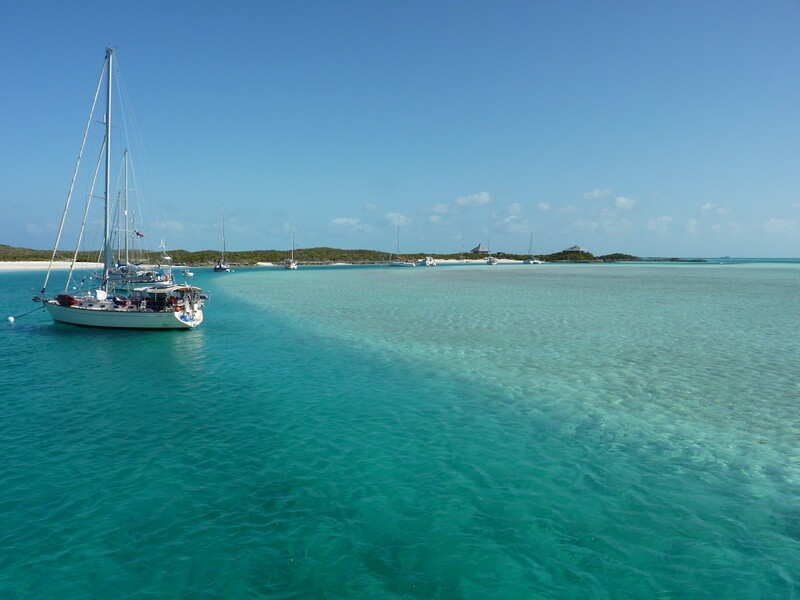 Gun Cay, Bahamas – A short run from Alice Town, we used this uninhabited island anchorage to stage for our next long trip across the Bahama Bank. Got up at 4 am for the 12-hour trip to be sure we arrived before dark. The Banks, while fairly shallow, were choppy, and we experimented with using the lower helm, which was surprisingly quite comfortable. Out away from marked channels and lots of boat traffic the visibility was fine and there was less motion below. Bob has installed some excellent navigational tools, and we have computer charts at both the upper and lower helm that tell us exactly where we are. We also carry paper charts, too, just in case. 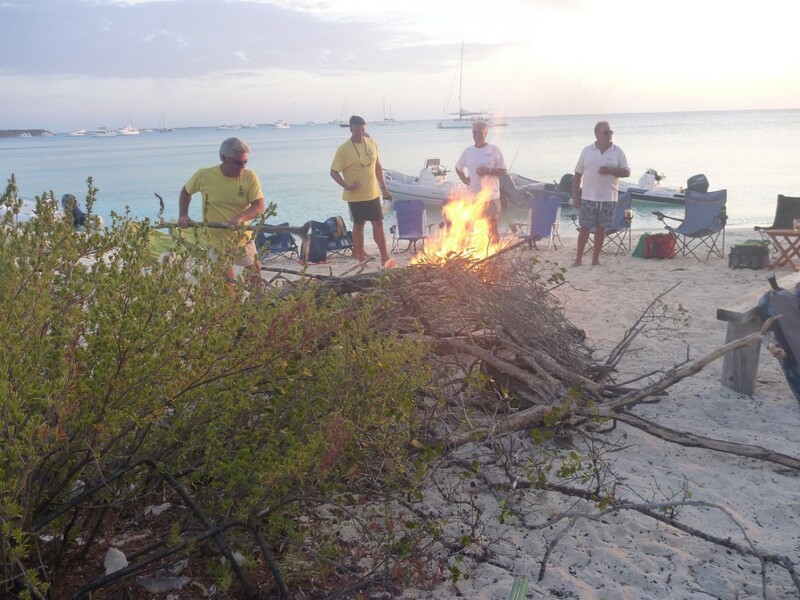 Bonfire on beach near Staniel Cay. Berry Islands, Bahamas – These islands are to the northwest of Nassau, bordered by deep water to the north, and the shallower Bahama Banks to the south & west. Some of the cruise lines have their private resorts established here for day stops. We spent the night moored off of Frazier’s Hog Cay. The Berry Island Club, a very simple establishment, with a small marina and restaurant/bar, ran the moorings ashore, and no dinghy dock, which made for an interesting rocky beach landing. They had a nicely done mooring field with new moorings and lines. Mooring here was preferable to anchoring given the strong current that runs through the area. Getting us, and the dogs, in and out of the dinghy was a challenge. Would sure hate to lose the dinghy motor and have to row against the swift current! I’m not sure even Ted could make progress against that current. Nassau, Bahamas – The trip to Nassau was about a 5 hour run from the Berries. 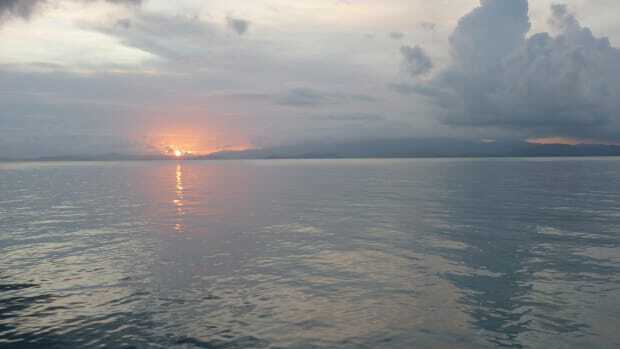 The winds were relatively light and seas calm. We saw a lot more boat traffic on this passage, including many large private yachts. We did not encounter any cruise ships until we got into the harbor, and that one (Royal Caribbean’s Majesty of the Seas) was docked. Because of the volume of large ship traffic, passage into the harbor is regulated, and all boats call Harbor Control for permission to enter. It is like an “air traffic control”. On the day we were there it was pretty straightforward. Everyone who asked for permission to enter the harbor was told “yes” and that was the end of the communication. We stayed at the Nassau Harbor Club, a pleasant marina with a pool and a surprisingly large supermarket and other shops just across the street. The marina was secured with a fence and doors to the street side, and had a security guard who patrolled the property all night. Likewise the shops across the street had a security guard stationed on every corner. We met a number of other cruisers who were passing through, most heading north for the hurricane season. The dockmaster, Dudley, was helpful and knowledgeable. He assisted us in getting easily into our slip, and rescued a departing 50′ sailboat that managed to get blown sideways onto the pilings behind our slip. He told us about a large private yacht in the $3M category that had run into a coral head the day we arrived and sank not far from the harbor. We had heard the radio calls about a “vessel taking on water” while under way, but didn’t know the whole story. That was a bit sobering, and we were extra careful two days later when we departed the shallow and unmarked eastern entrance to the harbor. Exuma Cays, Bahamas – The Exumas are a long chain of little islands, bordered on the east by the Exuma Sound (deep water) and on the west by the Exuma Banks (shallow water). Most of the islands are uninhabited or minimally inhabited. The Exumas Land & Sea Park covers 176 square miles in the middle of the Exumas, and is a protected area in which harvesting of sea life is prohibited. The number of live conch we saw there was unbelievable. We hopped down the chain, staying at Allans Cay, Highborne Cay, Normans Cay, Warderick Wells Cay, and Staniel Cay. All of these stops were anchorages, except for Warderick Wells Cay, where moorings are strategically placed within the narrow channel that winds around the sandbars. Warderick Wells is my favorite spot thus far in terms of scenery. The dogs also liked this spot since at low low tide there was a wonderful sandbar that served as a playpen of sorts and they could romp without being leashed. We stayed there three nights as an unexpected tropical wave had developed, and this location is fairly well protected. Ashore were park headquarters, and some great trails, including the one to BooBoo Hill where supposedly ghosts from souls lost in a shipwreck many years ago hang out. We didn’t find any ghosts, nor any hutia, a native protected species that looks sort of like a guinea pig. The park ranger hosted a potluck Easter Sunday dinner for visitors and park staff at his home. That was a lot of fun, and an opportunity to meet about 30 other cruisers who were passing through the area. Warderick Wells Cay north mooring field & park headquarters. We met up with several other DeFever Cruiser boats at Staniel Cay. Stephanie & Bob of September Song are familiar with the area, and served as tour guides for us newbies. 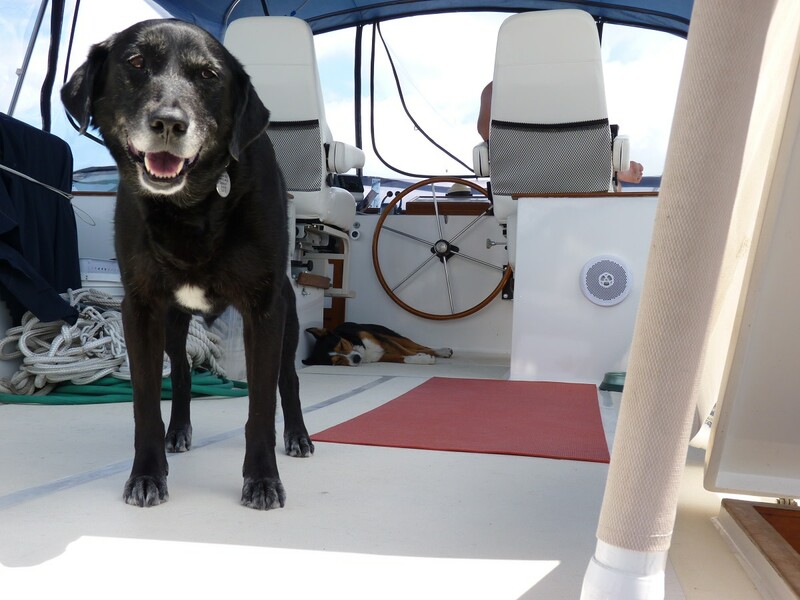 They have two Labrador Retrivers living aboard, and had some great pet travel advice. 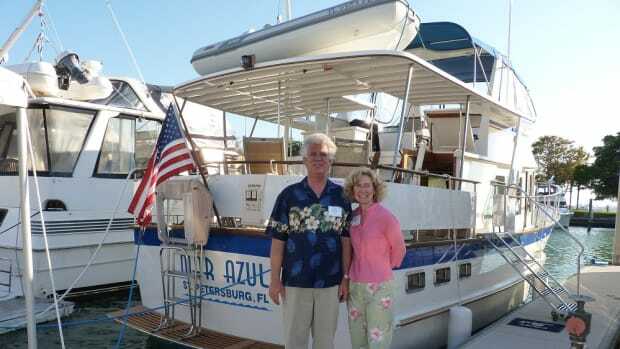 They organized social activities, including happy hour at the local informal Cabbage Key-like “yacht club”, and a sunset hors d’oeuvres and bonfire on the beach. 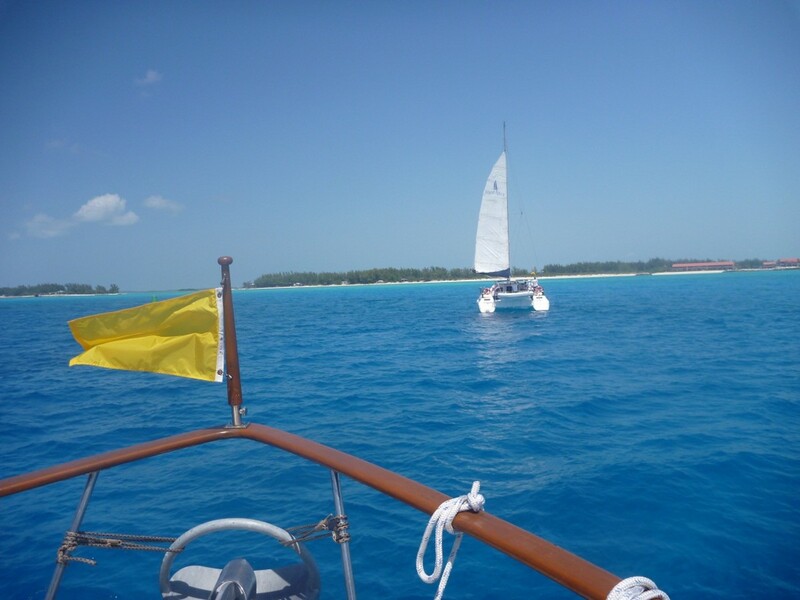 The cruisers we have met are extremely friendly, helpful and a wealth of information. 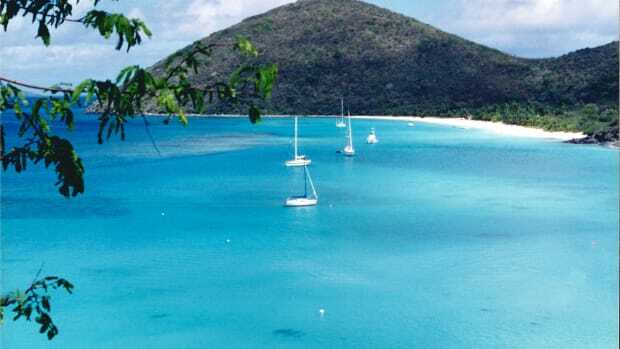 Later this week we will move on to George Town, then work our way to the Turks & Caicos.